A pair of biologists are studying terns on a rock island just off the coast. While walking on a distant part of the island, they are shot at by a group of thugs operating a pot farm. This happens several times and the local law enforcement refuses to investigate. On their last day on the island they happen into a huge pile of harvested grass that has been set out to dry. Quickly they decide to set it on fire to pay the thugs back for shooting at them. The fire takes off and sends plumes of smoke into the sky. As they are running for their boat, they notice that the soaring birds are acting weird, spiraling out of control and crashing into the trees. 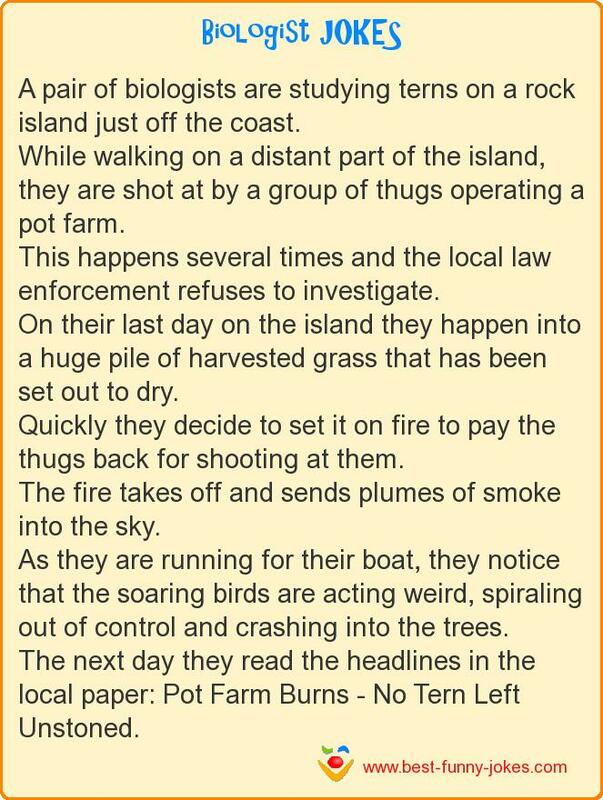 The next day they read the headlines in the local paper: Pot Farm Burns - No Tern Left Unstoned.